Speaking about the ITM's importance, Güney said "The high number of participants has not been a surprise for us. We are happy to get results on the efforts we have put in this organization for 2 years. "At the press conference Güney noted: First of all, welcome to the ITM 2018 International Textile Machinery Exhibition. I am highly honored to be together with our esteemed colleagues and friends, who did not leave us alone at our organization, and to welcome you at the ITM Exhibition. 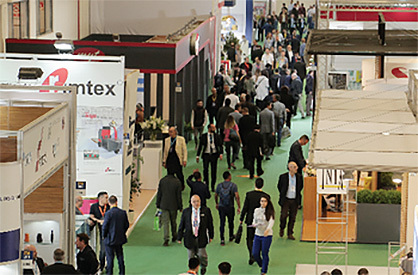 Being the largest exhibition of textile machinery in Turkey, the Middle East and the Near East, the ITM globally continues to be one of the industry's most important events. The biggest factor in this success is, undoubtedly, that it is being held in Istanbul, which acts as a bridge connecting the east and the west. Thanks to this geographical advantage, companies in the Middle East, North Africa, the Turkic Republics, the Balkans and Asia, which are developing rapidly both in European countries and in the field of textiles, are able visit Istanbul after a short 3-hour flight. Also due to the fact that textile manufacturers from Iran, Algeria, Egypt, Tunisia, Morocco, Pakistan and Bangladesh are experiencing visa issues on their trips to Europe due to the aggravated visa conditions of the Schengen policy, while they do not experience any such problems when they come to Turkey, is causing an increase in the number of visitors at our exhibition. Because of the ITM 2018 Exhibition, the occupancy rate at the hotels located on the European side has reached 80% now. The 100% occupancy rate at the hotels near the exhibition area shows that this year the exhibition will host a huge number of visitors. Another reason for the intense interest in this exhibition where textile technology leaders will make their global launches for their latest technological products and turn it into a textile show has been our promotion of the ITM by participating in the exhibitions in Iran, Uzbekistan, Pakistan, Moscow, Tunisia and Algeria. I believe that companies from these countries will see the latest developments in the field of textile technologies at the ITM exhibition and take them to their countries and that the textile industry will display a rapid development in these countries. The textile industry in the global world is experiencing a great deal of activities. We witness very serious investments especially in countries like Pakistan and Bangladesh. Organizing the ITM Exhibition in Istanbul, which geographically is the meeting point for the textile industry, also provides a great opportunity for companies who want to renew their technologies and make investments. ITM is becoming an organization where textile technology leaders exhibit their newest products as well as being a platform helping achieve major business cooperation in the industry. Companies serving in the sub-branches of the industry from cotton to yarns, weaving, knitting, digital printing, dyeing and finishing are displaying their latest technological products this year, in 12 halls on an area covering 120.000 sqm. This year we also have initiated many innovations at the ITM exhibition. For example, digital printing sector which was assigned one hall last year, will be held in two halls this year. Thus, we have been able to come together with the leading companies in the digital printing industry who could not participate in the previous ITM exhibitions. In addition, many weaving, knitting and yarn companies have also increased the number of square meter coverage and machine numbers at the ITM exhibition this year. More importantly, it has been a great success and a source of pride for us that the ITM 2018 has been as the first venue for the exhibition of the latest technological products of the textile leaders. We think that we have brought the ITM, which is held every two years, to a good level with our intensive efforts this year. We will continue to grow further in the forthcoming years. We hope that our participants and visitors will all be leaving happily from our country at the end of our ITM 2018 Exhibition. We are proud of hosting all our participants are visitors. I would like to thank them for choosing us.